How to watch LEGO: Justice League: Gotham City Breakout (2016) on Netflix South Africa! Sorry, LEGO: Justice League: Gotham City Breakout is not available on South African Netflix, but you can unlock it right now in South Africa and start watching! With a few simple steps you can change your Netflix region to a country like Canada and start watching Canadian Netflix, which includes LEGO: Justice League: Gotham City Breakout. We'll keep checking Netflix South Africa for LEGO: Justice League: Gotham City Breakout, and this page will be updated with any changes. 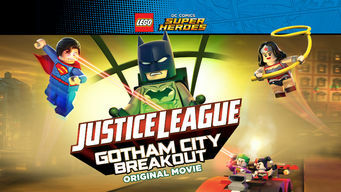 LEGO: Justice League: Gotham City Breakout is not available in South Africa BUT it can be unlocked and viewed! Superman watches over Gotham for a vacationing Batman. But familiar foes, a hot tub of horror and visitors from inner Earth soon disrupt their plans. Holy vacay! A certain caped crusader can use a break, but deadly foes are trying to kill the vibe -- and take the city. There is a way to watch LEGO: Justice League: Gotham City Breakout in South Africa, even though it isn't currently available on Netflix locally. What you need is a system that lets you change your Netflix country. With a few simple steps you can be watching LEGO: Justice League: Gotham City Breakout and thousands of other titles! Watch "LEGO: Justice League: Gotham City Breakout"